NETWORK UPDATE: Game 4 of the WORLD SERIES adjusted up 0.3 in final numbers to 3.4, and ABC’s COLLEGE FOOTBALL game was up 0.2 to 1.7. CABLE HIGHLIGHTS: Starz’s decision to premiere ASH VS EVIL DEAD on Halloween night, when much of its target audience was probably out enjoying the holiday (and to “sneak” the premiere after midnight the night before) may have lowered its debut to a blah 0.13. It was preceded by DAVINCI’S DEMONS, down 0.01 to 0.06/250K. The night’s other premiere was even less notable, as THE RETURNED had a 0.03/123K Season 2 launch on Sundance. Elsewhere, as usual for a fall Saturday the Top 10 was big on COLLEGE FOOTBALL and its associated programming, which took up all of the first 6 slots, led by ESPN’s primetime (1.15) and early afternoon (1.13) games. 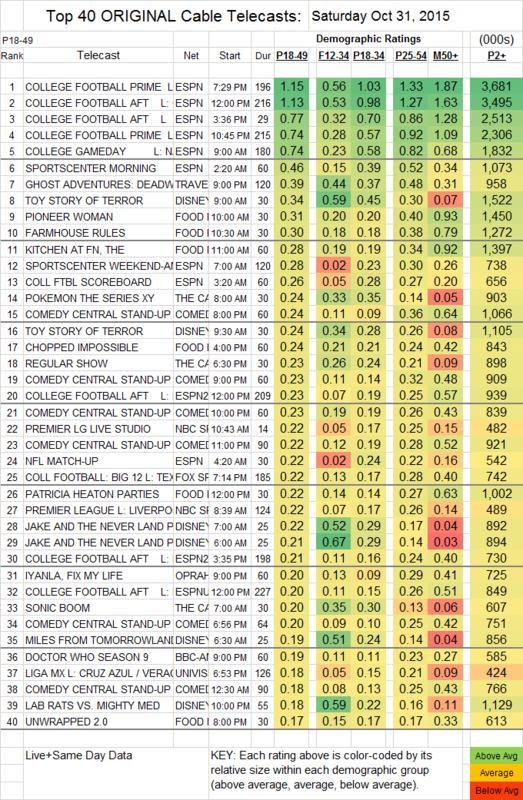 Everything else was far lower, headed by Travel Channel’s GHOST ADVENTURES at 0.39. Food Network’s PIONEER WOMAN upticked to 0.31, and its FARMHOUSE RULES was at 0.30, with KITCHEN AT FN down 0.06 to 0.28. On BBCAmerica, DOCTOR WHO dropped a horrific 0.25 to 0.19, and THE LAST KINGDOM fell 0.06 to 0.09.